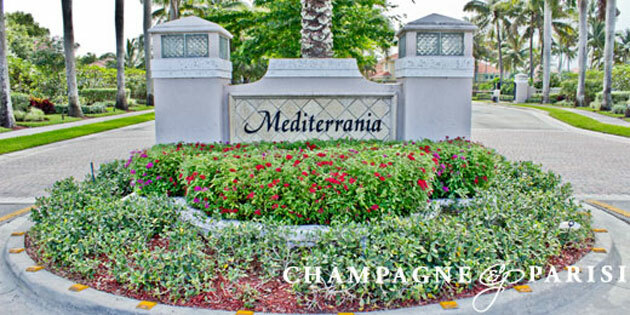 Mediterrania is an intimate gated community located in Boca Raton just south of Glades Road on Powerline Road. As you pass through the beautiful gated entrance, you will enter a community of tree-lined streets and lovely tropical foliage, the essence of this wonderful neighborhood that is so highly renowned for its tranquil and peaceful surroundings, all to be enjoyed year-round in the perfect South Florida weather. It truly is luxurious living at its finest in this beautiful community. As far as amenities go, Mediterrania is high up there: homeowners here have access to community tennis courts, as well as lighted walking, jogging, and biking paths. Also, this beautiful community is zoned for A-rated schools, including Del Prado Elementary, Omni Middle, and Spanish River High School. As you may expect, living in Mediterrania provides residents with easy access to all of the best Boca has to offer, as it boasts one of the most perfect locations available. For instance, only minutes away are entertainment venues such as South Florida's pristine Beaches, Boca Raton's most beautiful Parks, Mizner Park, the Boca Raton Resort & Club, Gumbo Limbo Nature Center, or even Boca Town Center Mall, the Boca Raton Museum of Art, and iPic movie theaters. Needless to say, I95 and Florida's Turnpike are also nearby for easy getaways to other cities such as Miami, Fort Lauderdale, or West Palm Beach. All in all, this community is truly a hidden gem in South Florida, as only a select few are lucky enough to call Mediterrania home.